Maximum sustained winds are near 30 mph, 45 km/h, with higher gusts. The Central Pacific Hurricane Center in Honolulu, Hawaii is issuing advisories on tropical depression Flossie, located in the vicinity of the island of Kauai. The system is moving toward the west northwest at about 18 mph. The remnants of former tropical depression Flossie is located about 225 miles northwest of Lihue, Kauai. The system is moving toward the west northwest at about 18 mph. There is a near zero percent chance of redevelopment. Norwegian Cruise Line's Pride of America was impacted by Flossie. The line decided to leave Maui a day early, in the abundance of caution, to head out to sea avoiding the approaching storm.The ship returned to its regular schedule today when it docked in Hilo. No further impacts are expected as the storm weakened. We've just completed our eighth annual appearance at the Streamwood Summer Celebration's Business Expo sponsored by the Streamwood Chamber of Commerce. 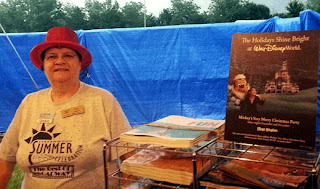 The Summer Celebration runs the last weekend of July each year and is well attended. We've had all sorts of weather over the years. This year we had the coolest temperatures with highs in the low 60's with a gentle breeze Friday and Saturday. There was a downpour on Friday night which concluded with a gorgeous full rainbow. 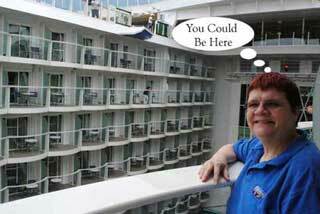 It reminded us of some we've seen onboard a cruise ship after the storm had passed. Sunday was a little warmer, but it was still more like Fall than Summer. We spoke to many couples, families, and individuals that were interested in getting away for a vacation. As usual, we had a large supply of brochures, which we call "wish books" on hand. One of the most popular brochures was the Royal Caribbean Oasis-class brochure which highlights this marvelous cruise ship. The most popular destination was Alaska. Coming in second was Walt Disney World Resort in Florida, the site of our National Convention last year. Unfortunately, I couldn't talk with everyone personally this year because I was splitting my time between my booth and the Streamwood Chamber of Commerce's booth. I still devote a lot of my time to the Chamber as past President, Board of Directors Member, and Chairman of the Streamwood Summer Celebration Chamber of Commerce Committee. On Friday, I was kept busy getting the businesses setup. Saturday and Sunday I was busy answering questions at the Chamber booth, making announcements, and judging contests. I'd like to thank my Executive Assistant, Donna Lenhardt, who was invaluable in getting the event setup and assisting me throughout the weekend. 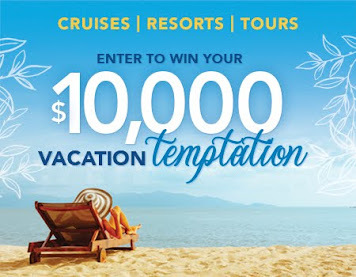 We had a special Royal Caribbean promotion with up to $200 onboard credit for select sailings now through 2014. The exclusive offer runs through July 31st - so be sure to see our website and Facebook Fan Page for complete details or contact us directly. There are many other promotions - see our website for complete details. 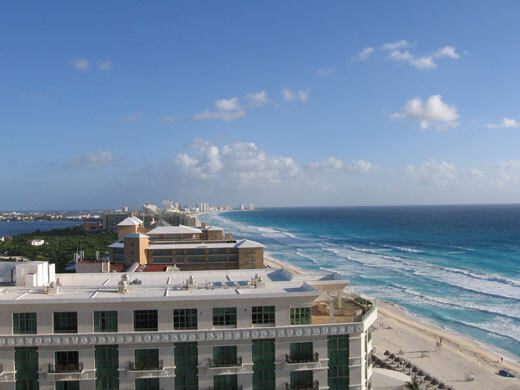 For those looking for a Resort Getaway, see our current Resorts & Tours Specials. The forthTropical storm of the 2013 Atlantic Hurricane Season formed over the Eastern Atlantic. There we never any coastal watches or warnings posted for this storm. This will be our 8th appearance at the show. I am Chairman of the Chamber's Summer Celebration Committee once again and am excited to report that the Business Expo will be even bigger than last year. I will be splitting my time between the Chamber Booth and my personal one, and look forward to meeting many of our fans during the three day event. Carnival Cruise Lines President and CEO, Gerry Cahill, announced on Saturday that the next newbuild, the 25th for the line, would be called Carnival Vista. Keeping with the tradition of taking the best features from one ship and adding some new unique features, you can expect some of the FunShip 2.0 restaurants, entertainment, and bars. 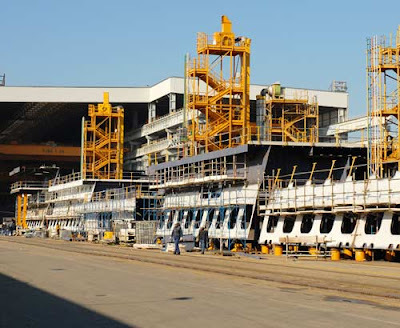 Italian shipbuilder, Fincantieri, has long been associated with Carnival Corporation. Fincantieri is one of the largest groups in the world in the design and construction of merchant and naval vessels specializing in the construction of complex ships with high technological content such as cruise ships and large ferries. This new 135,000 ton ship will accommodate 4,000 guests and enter service in 2016. Specific details about the design, homeport, and itineraries will be announced at a later date. Want to Learn more about Fun Ship 2.0? TOUCH this Image and then move your mouse over the various interactive buttons. 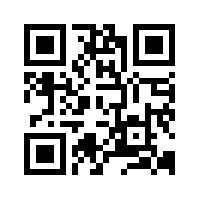 Watch Videos, View Menus, Get More Facts. Enjoy !! Five defendants: Roberto Ferrarini, director of Costa Cruises' crisis unit, cabin service director Manrico Giampedroni, first officer Ciro Ambrosio, Indonesian helmsman Jacob Rusli Bin and third officer Silvia Coronica had their day in court. Sentences ranged from 18 - 34 months. It is unlikely that any of them will actually have to serve jail time as sentences less that 2 years are suspended in Italy and longer sentences can be appealed. 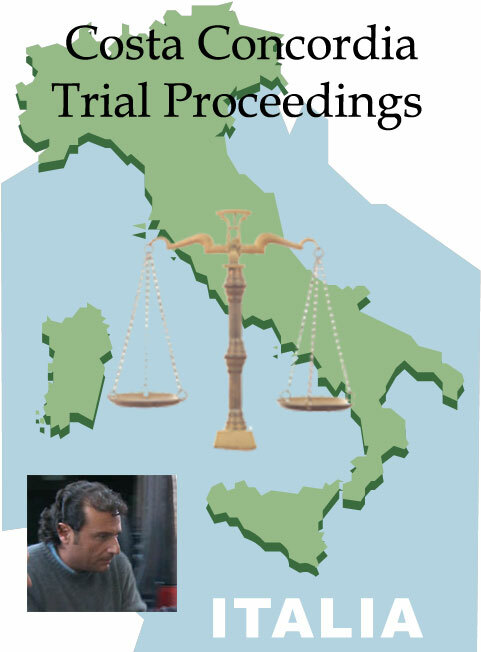 These proceedings were separate from the main trial for Captain Schettino, which began this week as well. Unlike this trial, which was short due to the acceptance of the plea bargain agreements, we expect a lengthy trial for him, given the amount of testimony and complexity of the case. Watch Concordia Captain's Trial Finally Underway for updates on the legal proceedings. 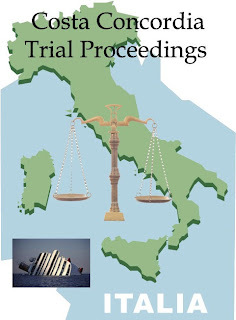 Eighteen months following the deadly accident off the coast of the Island of Giglio in Italy, the trial of Captain Francesco Schettino has finally begun in the tiny Italian village of Grosseto. The courtroom is in the local theater since the normal facilities would be too small. The entire world is watching as this trial continues. 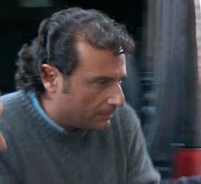 Schettino is accused of three criminal charges: involuntary manslaughter for the deaths; causing a maritime disaster; and causing personal injury to 150 people who were badly hurt in the accident. If convicted, he could face up to 20 years in prison. It is expected that if that does occur, his lawyers would request that be served under house arrest arrangements since there would be no risk of him repeating the offense (his captain days are over). In addition to the criminal charges, there are 250 civil actions filed against the captain, all of which will be represented at the hearing. Among the actions is one by Costa Crociere, the owner of the Concordia, which is suing the captain for causing the accident and destroying the Concordia. Immediately after the accident, the cruise line distanced themselves from the captain, clearly indicating that they would take these actions against him. Moldovan dancer, Domnica Cemortan, who was on the bridge when the Costa Concordia cruise ship crashed into a reef near Italy, killing 32 people, has testified at the captain's manslaughter trial that the two were lovers. Four other officers and the crisis coordinator for the line will also be on trial this week. They filed similar plea bargains in May and their hearing is to begin this Saturday. Just two days after the trial of Costa Concordia captain Francesco Schettino opened, it was adjourned until September 23 for the Italian court system's summer break. Yesterday, defense lawyers for Schettino entered a plea bargain request where he would plead guilty in exchange for a 3 year 5 months sentence. The prosecution voiced opposition to the request, which is likely to be turned down by the court in a few days. Names of the victims and how they died were read into the court's record as the trial began. Watch this post for updates on the legal proceedings. Day 7 of our Celebrity Xpeditions finds us on Isabela Island, which is by far the largest island in the Galapagos Archipelago. It is composed of of 6 shield volcanoes - Alcedo, Cerro Azul, Darwin, Ecuador, Sierra Negra and Wolf that over the years have coalesced into one island. All of these volcanoes are considered still active with the last volcanic eruption occurring in May 2008. There are five different subspecies of giant tortoises spread upon their slopes; almost all of the wonderful photos of these giant tortoises you may have seen were probably taken here. Today we had our first opportunity to find the giant land tortoises (Galapagos). Urbina Bay, a beautiful, small bay located at the east base of the Alcedo volcano. The bay coastal area was uplifted 12 - 15 feet along a shore line of over a mile. The violent action happened so quickly that it trapped crustaceans, echinoderms, mollusks, and fish species inland. 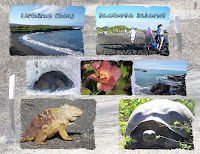 The trail starts on the beach where a wet landing is made, the tour is approximately 3200m, and runs through sand substrates, pumice rock, lava, coral and vegetable formations in a coastal area that has had a lift; in addition burrows of land iguanas can be seen. This area is also directly affected by the Cromwell Upwelling Current. The Cromwell is a dep water current traveling along the equatorial line form the western Pacific eventually coming in contact with the Galapagos Archipelago. This nutrient rich, cold water comse to the surface with temperatures reaching the mid 50's (10 -13 degrees Celsius). View our Galapagos - Urbina Bay photo album for more images of our morning excursion on the Island of Isabela. 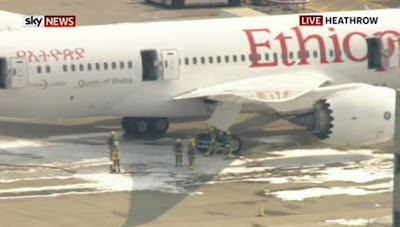 According to London Heathrow airport website, a fire broke out on a parked Ethiopian Boeing 787 Dreamliner causing a suspension in flights in and out of the airport. As of this writing, there is a resumption of flights, but they are advising you check with your airlines for possible delays. The good news is that noone appears to have been injured as there were no passengers onboard at the time of the incident. Several fire brigades responded to the scene and runways were closed while the fire was contained. The runways are now fully re-opened, following an earlier internal fire on-board an aircraft. All arrivals and departures were earlier temporarily suspended while airport fire crews attended to the incident. Flights are now operating, but will be subject to delay. Please check the status of your flight with your airline before travelling to Heathrow. The Metropolitan Police Service have advised that there were no passengers on board and no reported injuries. You can keep up-to-date by following Heathrow on Twitter and Facebook or receive individual flight status updates on the move by using our mobile app or our SMS text service. This just adds to the string of problems that have been reported with the new aircraft developed by Boeing. Earlier this year, the FAA grounded all Dreamliners operated by U.S. companies until they could be deemed safe following problems with the batteries onboard. Boeing found what it believed was a solution to the problem and flights resumed. Following the fire onboard Grandeur of the Seas at the end of May, the ship was taken out of service to complete the necessary repairs. The ship will sail its first cruise July 12th and is currently sailing a 1-night cruise for media and travel industry partners. As was the case with the recent return to service on Carnival Sensation, despite best intentions, not all of the necessary repairs have been completed on Grandeur of the Seas. Therefore, Royal Caribbean has "re-accomodated" passengers from 78 cabins to allow room for the repair crew that is onboard. These passengers will be provided with full refunds and an incentive for a future cruise. It is hoped that all repairs will be completed during this cruise so that passengers on the July 19th sailing won't be impacted. Unfortunately, this is the risk one takes when booking the first sailing following a dry-dock of this nature. Regent Seven Seas Cruises announced that they have signed a contract with Italy's Fincantieri shipyard to build the most luxurious cruise ship in the era of modern cruising. The new all-suite, all-balcony ship will be named Seven Seas Explorer with delivery scheduled for summer 2016. "This new ship order represents an exciting time of growth for our company as we build the next generation of cruise ships for the world's most inclusive luxury cruise line," Frank Del Rio, the chairman and CEO of Regent's parent company, says in a statement accompanying the announcement. "Seven Seas Explorer will be the most luxurious cruise ship ever built." The price tag for this all-suite, all-balcony luxury cruise ship has been reported to be $450m USD making it the most expensive luxury vessel afloat according to the line. "This new ship order is part of our disciplined growth strategy to expand our footprint in the luxury market," said Kunal S. Kamlani, president of Regent Seven Seas Cruises. "Since we purchased the Regent Seven Seas Cruises brand in 2008, the ships have sailed full with industry-leading yields. We strongly believe that now is the right time to expand our fleet as our loyal guests have asked for a greater array of itineraries and our travel partners have proven that there is pent-up demand for a new Regent ship." Additional information about the new ship will be released in the coming months and we will provide updates as the information is provided to us. We look forward to welcoming this new ship to Regent's fleet. 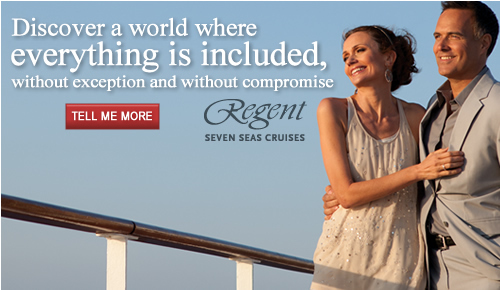 Click the following link for more information about Regent Seven Seas Cruises. It has been 18 months since the Costa Concordia accident which claimed the lives of 32 people off the coast of Giglio, Italy. After pre-trial activities completed, including plea bargains for Costa Cruise Line, Captain Francesco Schettino arrived at the temporary "court house" in Grosseto, Tuscany ready for his day in court. 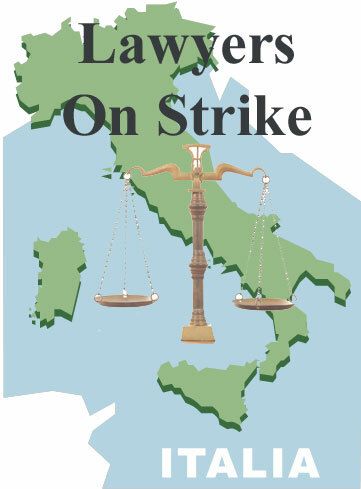 As is customary in Europe, approaching labor strikes are pre-announced. 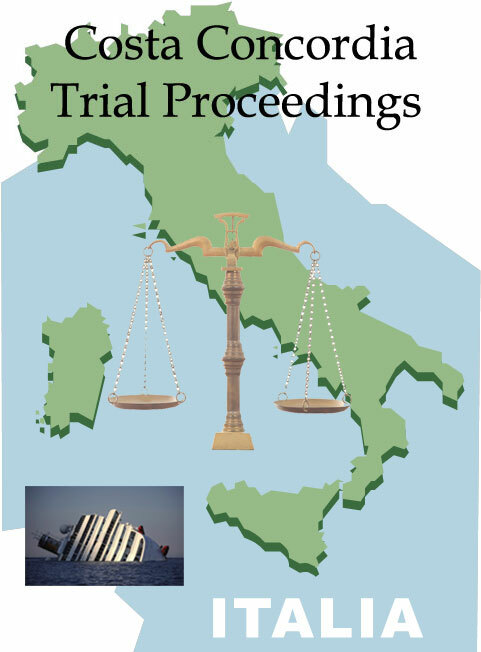 As anticipated a nationwide Lawyers Strike, scheduled to start today, caused a delay in the Costa Concordia trial. The judge had no choice but to delay the trial until July 17th. Upset lawyers had called for a strike after the Prime Minister passed a decree attempting to streamline jury trials. The PM accused the lawyers of blocking reforms. NEAR 45 MPH...75 KM/H...WITH HIGHER GUSTS. DISCONTINUED ALL THE REMAINING TROPICAL STORM WATCHES AND WARNINGS. MONITOR THE PROGRESS OF THE REMNANTS OF CHANTAL. The third Tropical storm of the 2013 Atlantic Hurricane Season formed over the central tropical Atlantic and is racing towards the Lesser Antilles. Watches and Warnings have now been posted for several islands as well as Puerto Rico. EASTERN CUBA DURING THE NEXT DAY OR SO. ONSHORE FLOW ALONG PORTIONS OF THE SOUTH COAST OF HISPANIOLA. ...RECONNAISSANCE PLANE EN ROUTE TO VERIFY.. The fifth tropical storm of the 2013 Eastern Pacific Hurricane Season formed off the southwest coast of Mexico. It is expected to produce 3 to 5 inches of rain on the coastal states. After becoming a hurricane on Saturday, the storm has weakened once again to tropical storm strength. LOW WITHIN THE NEXT 48 HOURS. 1 TO 3 INCHES OVER THE SOUTHERN BAJA CALIFORNIA PENINSULA. 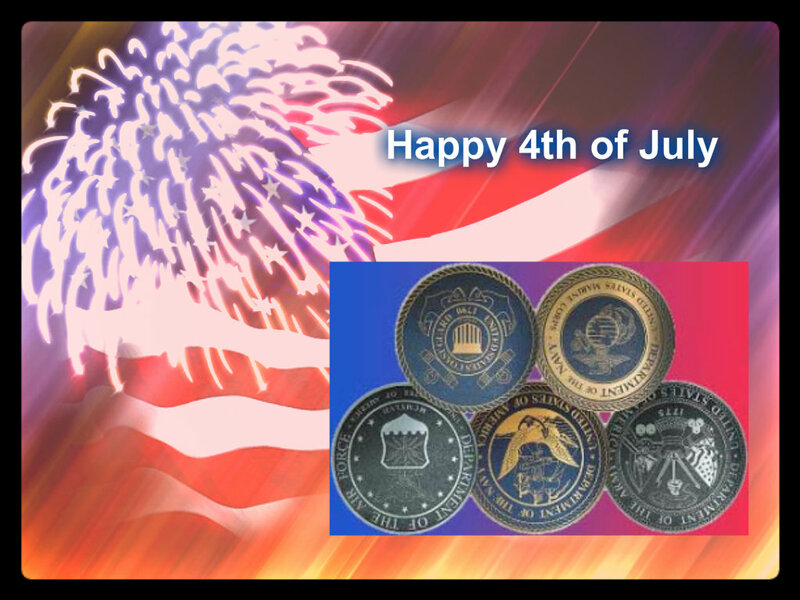 We hope that you are enjoying a wonderful Fourth of July with family and friends. Across the globe, there are many families that are apart from loved ones. Those are the men and women of the Armed Forces who are serving to protect those freedoms that we celebrate today. Let us salute those men and women who sacrifice so that we can enjoy this holiday. We'd like to thank all the military personnel, past and present, for serving their country. 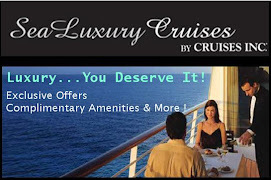 Many of the cruise lines offer military discounts. If you know someone who has served, make sure they are aware of these discounts - it's the least we can do for them that have made this day possible. Why would you select a resort vacation? First of all, there's the view !! Everyone loves to travel and we know you’re always on the lookout for new vacation options as well as special offers. 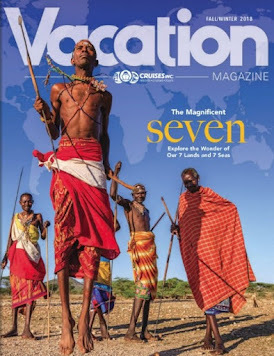 As Vacation Specialists, we are dedicated to helping you plan the perfect vacation, whether it’s on a Mediterranean cruise through Europe or at an all-inclusive beach resort in the Caribbean. We work hard to provide our customers with as many options as possible. With this in mind, we are very excited to share that we have just added a huge selection of RESORT VACATION PACKAGES to our website. Resort vacations afford travelers many of the same benefits as cruise vacations plus plenty of unique ones as well. Most of the resort vacations that we now offer are all-inclusive, so your accommodations, meals, beverages, activities, and more are all included, just like a cruise. They may also be packaged with airfare, adding even more convenience and value, plus extra perks such as free and non-stop airport transfers, a free/extra night’s stay, or a free round of golf. Not only do we offer exclusive pricing, but most of our resort packages provide all-inclusive accommodations that include meals, beverages, tips and more. Some even include airfare and extra activities. Whether you travel as a couple or with a large family, there are no surprises when it comes to managing your vacation budget. Whether you want to wake up to the sound of the ocean or be in walking distance to historical landmarks, a resort vacation can put you in the destination you’ve always dreamed of. We feature hundreds of resorts in the top 4 vacation destinations around the world: Caribbean, Mexico, Hawaii and Florida. Get all of the extra perks that are included in resort vacations, such as airport transfers, multiple restaurants, water sports, kids programs, entertainment and more. Resorts understand the need to provide you with an unforgettable vacation and they go the extra mile to ensure your stay is just that. And everyone gets to do what they want, when they want, at whatever pace works best for them. We’re pleased to be able to enhance our vacation options to our customers. 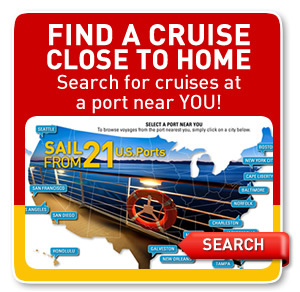 We hope you’ll contact us when it’s time to book that next getaway – by land or by sea! Over one hundred fifty years ago, a man wrote about his quest that took him to a place where he would discover how life evolved thousands of years ago. Travel with us as we follow in his footsteps and discover a land that is inhabited by species that can be found nowhere else on earth. Come with us on our Celebrity Xpeditions adventure that begins in Quito, Ecauador where we had the opportunity to visit local sites including the Equatorial Line Monument. Here you can stand on a line between the two hemispheres. Our ultimate destination is an archipelago of volcanic islands near the equator in the Pacific Ocean. We are met by a team of naturalists who transport us by Zodiacs to our waiting ship, Celebrity Xpedition. 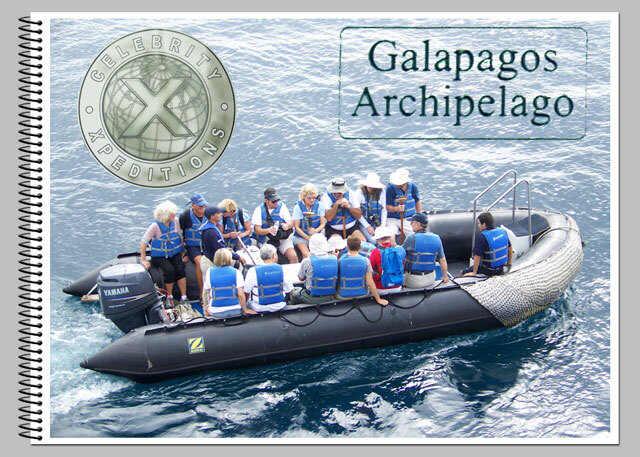 Celebrity Xpedition recently had their license suspended as we had reported (Lobsters Keep Cruise Ship from Entering National Park) and have now resumed sailing (Celebrity Xpedition to Resume Galapagos Sailings). We are assembling past articles, posting images, and adding new material in this diary so that you can easily follow our complete adventure. 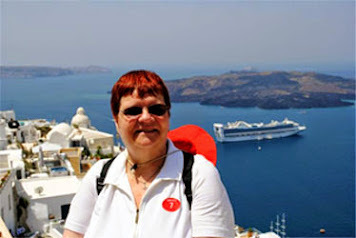 If you have any unanswered questions, we'd be happy to answer them and also help plan your own unforgettable adventure. We are eighteen months away from the implementation of new regulations restricting the Sulfur oxide (SOx) emissions of marine fuel in the North American Emission Control Area (ECA). Under the new regulations, effective January 1, 2015, cruise ships operating in the zone must only emit .01% instead of the currently allowed 1% levels. The ECA requirements will become enforceable in the U.S. Caribbean ECA in January 2014. Complete details can be found in this EPA Briefing. These low-sulfur fuel requirements could dramatically increase operating costs for the cruise lines and Carnival Cruise Lines has announced deployment changes of several ships as it tries to get ahead of the curve of the new regulations. The area of the North American ECA includes waters adjacent to the Pacific coast, the Atlantic/Gulf coast and the eight main Hawaiian Islands. 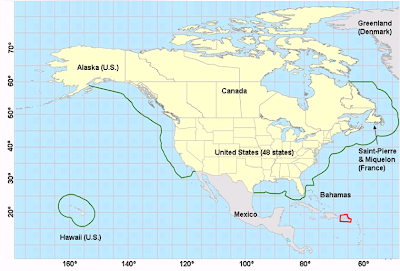 It extends up to 200 nautical miles from coasts of the United States, Canada and the French territories, except that it does not extend into marine areas subject to the sovereignty or jurisdiction of other States. The announced redeployments means reduced Atlantic Canada cruises and no ships homeporting out of Baltimore, Boston or Norfolk, Virginia.These are the first announced changes that site the North American ECA and associated fuel costs as the determining factor. Carnival Cruise Lines and others, including Royal Caribbean, which has ships in the same ports, are working closely with the EPA to find alternative means to reduce the emissions. One possibility is scrubber technology as cited in the letter in the references below. The cruise lines have held the line on passing fuel surcharges along to consumers. Hopefully they will be able to find an economical solution to protecting the environment. "CLIA supports the goals and principles of the North American Emission Control Area (ECA). Our industry is committed to protecting coastal air quality not only because it is the responsible thing to do, but also because the very nature of our business depends on a healthy natural environment. We are proud of the environmental stewardship of our member lines and their proactive response to applicable international and Federal air emissions requirements wherever their ships operate." We will continue to monitor this developing story. It is unfortunate that Carnival Cruise Lines has made these changes, but hopefully they will be able to return to these homeports in the future.